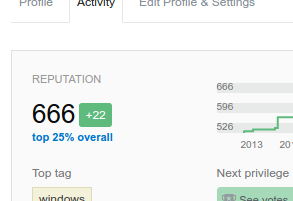 I've noticed today that my reputation on ServerFault corresponds to the number of the beast. It makes me very unhappy. I don't have in mind any interesting ServerFault-related question which could receive upvotes (and obviously, with such reputation, I'm damned to receive no upvotes any longer), so would it be appropriate to post a bad question or a bad answer intentionally to receive downvotes? If not, what else should I do to make this unholy reputation number change? Although Journeyman Geek an anonymous voter already solved that, another approach is to add a great answer to one of the 44'000+ unanswered questions (or any other question for that matter). Someone downvoted you. Now your reputation is 664. Now make sure you do not get exactly 2 reputation points more.